Head over to Amazon and score the following titles for under $14.99!!! Alice in Wonderland (DVD/Blu-ray) $9.99 & FREE Shipping on orders over $49. The Aristocats (Two-Disc Blu-ray/DVD Special Edition in Blu-ray Packaging) $9.99 & FREE Shipping on orders over $49. Oliver & Company: 25th Anniversary Edition (Blu-ray/ DVD Combo Pack) $9.99 & FREE Shipping on orders over $49. Dumbo (Two-Disc 70th Anniversary Edition Blu-ray / DVD Combo Pack in Blu-ray Packaging) $13.92 & FREE Shipping on orders over $49. Alice In Wonderland (Two-Disc 60th Anniversary Blu-ray/DVD Combo) $13.99 & FREE Shipping on orders over $49. 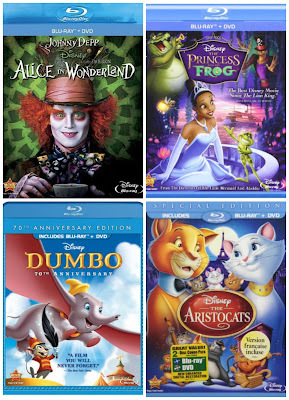 Princess & The Frog (Two-Disc Blu-ray/DVD Combo) $14.96 & FREE Shipping on orders over $49. Robin Hood: 40th Anniversary Edition (Blu-ray + DVD + Digital Copy) $14.99 & FREE Shipping on orders over $49.